Link to the online Premium List! Click here. 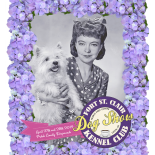 This year featuring Springfield Ohio star of the silent screen Lillian Gish and her beloved West Highland White Terrier, Malcolm. Our annual all-breed dog show is held at the Preble County Fairgrounds, 722 S. Franklin St, Eaton, OH. In 2019 it will be on April 27th and 28th. We are part of the AKC National Owner-Handled Series and on both Saturday and Sunday, we will be awarding a special Best in Show to an Owner-Handled dog. We will again feature our very popular Special Attraction Brace competition, as well as a Parade for the Winners of Best Veteran in Breed. We will have OFA eye exams on Saturday, the cost is $40. For more information, check out our Facebook page, send us an email at fsckc@earthlink.net or call (937) 781-6561. Fast Cat is a different weekend this year– May 18th & 19th with two trials both days. Free coffee and treats all day long. If there’s anything we can help you with, don’t hesitate to let us know! Your PDF to your show premium refused to open…..